Novotel Fujairah is located in the city centre in the heart of the business and commercial district. This contemporary 4-star hotel has a beautiful outdoor swimming pool and bar serving drinks and snacks. Exceptional convention facilities are available for any special occasion, from intimate meetings to elaborate weddings at Novotel. Fujairah is a town full of culture and heritage, surrounded by nature's beautiful mountain range. 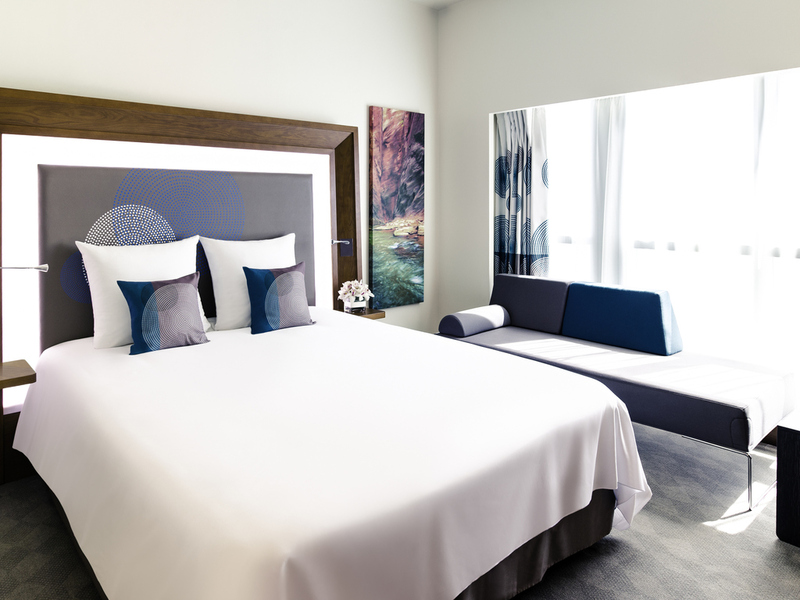 Just an hour's drive from Dubai, Novotel Fujairah boasts prime location making it ideal for both business and leisure. Spacious, contemporary in design, and adaptable, the Novotel room is truly a place for living, perfect for all your needs. Located on the top floors and overlooking Mountains or Fujairah City, all rooms have free WIFI and free mini bar, eco certified bathroom products and both bathtub and shower. Executive rooms have extra amenities while Suites provide more space. Coffee to go, balanced dishes, freshly made cakes and pastries, all served in a comfortable setting with floor to ceiling windows overlooking Fujairah. Kids' corner is discreetly connected with the café, free WIFi available for every guest. Partnering with Nespresso, the renowed luxury coffee brand,City Café is a Grab N' Go concept with an upscale touch. Freshly prepared daily sandwiches,salads,pastries & cakes accompanied by luxury coffee,tea,shakes,coolers & freshly squeezed juices. For every prohibition you create, you also create an underground. A small intimate speakeasy bar hidden behind a bookcase. Transform yourself back to the 20's and fully absorb yourself within the prohibition era. 제공된 모든 써비스에 대해서 만족합니다. 단, 조식을 위한 식당이 많은 고객이 동시간에 몰려서 인지 상당히 혼잡한 느낌이 들었습니다. 넓은 회의공간, 구두닦이기계 설치 등 비즈니스맨을 위해 신경쓴 부분은 맘에 들었음. 방도 넓고 조용하고 조식도 괜찮았음. 하지만, 로비에서 나는 담배냄새, 방에서 나는 퀴퀴한 냄새, 특히 화장실에서 나는 불쾌한 냄새, 전체적으로 냄새때문에 쾌적하지 못한 느낌을 많이 받았음. 카페트에 지저분한 얼룩이 너무 심했음.